When I started with mentoring back in 1999 I was reading everything I could find on the internet about mentoring and other supporting themes. I didn´t find it easy to find something and a lot of the pages was consultants who wanted money for every thing bit. So when I started my blog back in 2008 one of my goals was to find the best blogs about mentoring. Of course I also want to be on the list. I started with a goal to find 25 of the best mentoring blogs, because I saw that leadership blogs have a similar competition for the 50 best leadership blog. Mentoring is a bit smaller than leadership, therefor 25. But in the end I had to narrow it down to 18. At the same time its difficult to know which glasses to wear when looking. Am I a first timer to mentoring, a coordinator or consultants? And I know some people will have some others on the list, and that is very good. A discussion about this will only make it better. CONGRATS TO ALL ON THE LIST! 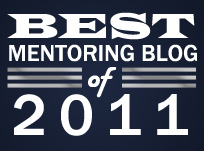 So with some doubts present this list of “The Best Mentoring Blogs 2011”. Glad that you are enjoying my blog. I have this year put up a new website, http://www.davidclutterbuckpartnership.com. I retired from my company Clutterbuck Associates — the pioneer of mentoring in Europe –at the beginning of this year.